No no, Herpangina is not a new kinda herb nor recipe. It's also not another variant of the drink Orangina LOL but Herpangina is an illness caused by a virus, characterised by small blister-like bumps or ulcers that appear in the mouth, usually in the back of throat or the roof of the mouth. Herpangina most commonly affects infants and young children aged 3-10 years and less common in adolescents and adults. The child often has a high fever with the illness. My BoiBoi was having recurrent high fever of above 38C since last Monday. Took him to two peads and came back with similar diagnostic of tonsillitis. His fever persists over 7 days and mostly peaked at wee hours in the morning which is kinda weird cos usually it will subside after a few dosage of fever meds or voltaren especially when it peaked at 38.8C. We first noticed one huge blister in his mouth and his gums are red in colour on Thursday. Later on his mouth is filled with blisters of different sizes at various locations. He had some difficulties in eating but he's a trooper. He had fewer bites and we fed him ice-creams and loads of manuka honey (UMF16). Made him rinse and gargle with Bactidol but he complained it's bitter, so his daddy made him rinse with salt water at regular intervals. We were a bit relieved when his fever is gone on Saturday and he became his usual active self. However, his fever came back on Sunday. BoiBoi is finally diagnosed with Herpangina on Monday when we took him to his pead again, not surprising since the incubation period is 7-14 days. Yesterday, most of his blisters were healed and back to jumping around like normal. Since it's contagious, we'll check on his progress today if he's fit to get back to school tomorrow. Sighhh... it has been a long sleepless week for us but nothing beats seeing him on the road to recovery. We've missed attending Asian Food Channel’s preview of Michelin Chef Daniel Boulud’s “One Night In Singapore” with Frat last Friday and also yesterday's launch of Best Eats KL and theQguides. Apologies to those who have emailed me inviting to their restaurants for food tasting, food hunt, and Ministry of Federal Territory's launch of Blog of FT. We hope you'll understand that we're not in the right frame of mind for all these fabulous offers. So, we've learnt a new word and disease - Herpangina and we hope you're aware of this by now especially if you have young children at home. Also, please check out pulled-elbow syndrome and handle young children with care. Another easy peasy braised chicken recipe. This one used a whole lot of shallots which lend a sweet caramelised taste to the gravy. Fry shallots in some oil till browned before adding ginger and garlic. Stir till fragrant. Add in chicken pieces. Cook chicken till brown. Add water and (A). Cover with a lid and lower the heat. Braised chicken till softens and the sauce thicken. Dish up and serve hot with rice. Sorry for the long silence, was not in the mood nor have the time to blog since my BoiBoi is having a bad case of tonsillitis since Monday. His fever hovers above 38C and seems to peaked at wee hours in the morning. Fever tapered off yesterday and gone this morning. Recovery is slow since his mouth have some large ulcers and sore throat which make eating or drinking painful. Seems like he has gotten so much better this morning since he managed to eat without complaining. Hopefully he'll be all right by now. Another news to rejoice is Kai Xin had a successful liver transplant and made a quick recovery that she's back in Kuala Lumpur. YAY!!! So here's something sweet to brighten the day up at the same time testing out Capt'n Hook's new torch LOL. Preheat oven to 150C. Place cream and vanilla beans in saucepan over low heat and simmer for 3 mins. Set aside for 20 mins. Whisk egg yolks and sugar till well combined. Slowly pour over the cream mixture and whisk well. Return mixture to saucepan and stir over medium low heat for 6 - 8 mins or until thick enough to coat the back of the spoon. Remove vanilla bean and strain mixture into 6 x 3/4 cup capacity ramekins. Place ramekins in a baking dish and pour hot water to come halfway up the side of the ramekins. Bake for 15 - 20 mins or until custard set. Remove ramekins and refrigerate for 1 hour or until cold. Place ramekins on a baking tray and sprinkle with extra sugar and allow to stand for 2 mins. Torch the sugar to melt and caramelised them. Wishing all Muslim friends and readers all the blessed moments of happiness today and always! For those who are travelling, have a safe trip and happy holidays. This is a rather healthy fried rice using day old rice, eggs, prawns, diced red and yellow bell peppers, chopped garlic, a little oil and chopped spring onions. Just need to place a little oil in a wok and scramble up the eggs and set it aside. Then pour in some oil and fry the garlic till fragrant (not browned) before adding in the prawns. Stir till cooked and add in some salt. Next add in the bell peppers and stir a bit before adding in the rice. Stir quickly to mix them up evenly. Pour in some soy sauce to taste and white pepper. Mix in the eggs and spring onions and dish up. Serve hot. The Yogitree in The Gardens has been one of our fave place to chill out whilst having delicious meals be it for lunch, tea, or dinner. This is another marvelous creation of Chef Ekachai of The Social, Planter's Jim and T Club. For this cafe, they're serving healthy dishes using fresh, natural and mostly organic ingredients without using addictives. As usual, when most people, well especially like Capt'n Hook, see the words healthy and organic, they'll immediately have words like bland, boring, tasteless crop up in their mind and are usually very skeptical about the taste. Asking them to eat these kinda food is like dragging a cat for a bath! Somehow one day Capt'n Hook and I decided to dine here for dinner. He was squirmish but after his first taste, he took a liking to the food here. Once, we were here for dinner and we opted for their set dinner which is really value for money. They have Oriental Set at RM49++; Fish of the Day Set at RM65++ and Western Dinner Set at RM69++ (click the link to see sample menus). You can opt for a glass of wine or fresh juice. Starters are usually soup, followed by a few choices of main course to choose from and ends with a dessert which you can pick from the cake display. We tried the Oriental set where we opted for a juice. Watermelon juice was served and seriously, it's refreshing and tasted naturally sweet. 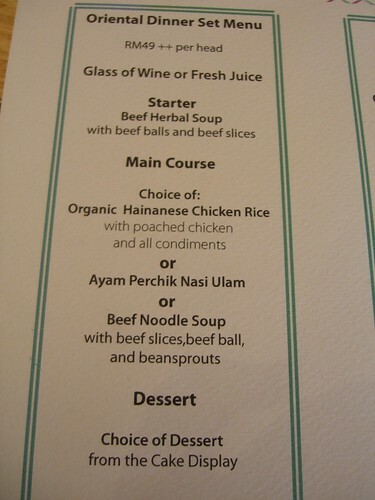 That day, we were served Beef Herbal Soup which has clear broth and 2 springy beef meatballs. Capt'n Hook opted for Ayam Perchik Nasi Ulam which was surprisingly good. He usually doesn't fancy the multigrains rice I cook but he has no complain here with the brown rice eaten with the freshly chopped ulam (leafy herbs). The chicken is baked before perchik gravy is slathered on it. This is tasty and he wished they gave more of the gravy. In the platter was a piece of fried fish marinaded in turmeric. Quite a huge portion I would say. As for myself, I asked for Beef Noodle Soup. Adoi, I found out the soup base is actually the same soup that they served as the starter. *roll eyes* Sighhh they should have serve a different kinda of soup eh??? The taste is similar to Vietnamese Pho but the herbs and spices taste are stronger. As we were too stuffed, we packed our desserts back. Since the cakes were served with ice-cream, they allowed us to have the ice-cream there. We picked a Carrot and Orange Cake with Cream Cheese frosting and Peach and Banana Crumble. The carrot cake is moist and packed with carrots as you can see below. I liked the crumble a lot as it contained thick layers of peaches and bananas! On another occasion, we were there with BoiBoi in a weekend. I shared a Soup of The Day which is Cauliflower Soup (RM16) and Grilled Organic Chicken on Toasted Ciabatta with Basil Mayonnaise and Tomato Salsa (RM20). Both portions are quite large, luckily we were sharing. The soup was just normal but loved the crispy garlic toast that came with it. The sandwich has a lot of thickly shredded chicken inside. The sandwich is so tall that was kinda messy to eat up hahaha BoiBoi was busy wiping up after each bite. BoiBoi had a Very Berry (RM12) juice which has strawberry, raspberry, blueberry, cranberry and carrot. It was indeed a very berry combi and tasted a little on the tangy side. Capt'n Hook ordered the Roast Beef and Yorkshire Pudding (RM39) which is only available on weekends. The beef was roasted perfectly to his liking. The meat was tender, almost melt in the mouth texture. I will definitely order this again. We ended our meal with an old school cake, Pineapple Upside Down Cake served with vanilla ice-cream. Hmm very moist and the best part is they uses fresh pineapples and not canned ones! Since today has such an auspicious date, I just wish Yogitree will have a long life like Planter's Jim and The Social!!! I've made this fruit cake a while back. Using Donna Hay's Grandma's Fruit Cake as the base, for the dried fruits, I just got a pack of 500g mixed fruits and added in almond slivers and some currants. I placed them in a glass jar and pour in enough brandy (or you can use rum) to macerate them for a few days in the fridge. Place the fruit and nuts in a bowl & pour over the brandy. Cover & allow to soak overnight. Pre-heat oven to 140C. Place the butter & sugar in the bowl of an electric mixer & beat until light & creamy. Gradually add the eggs & beat well. Place the butter & fruit mixtures, flour, baking soda, all spice & cinnamon into a large bowl and mix together to combine. Line a 20cm (8 inch) square cake tin with two layers of non stick baking paper. Spoon in the mixture & bake for 2 hours or until cooked. Pour over the extra brandy while cake is still hot. Cool in tin. Serves 12.